It is not so odd to think about video games as a form of art. Through the different genres, the consumers as well the avid players, can see the different process where gaming is more than a repetitive process as there are a combination between beautiful graphics and a compelling story line. The evolution of the gaming industry has been quite slow; not many people realize that video games (at least when it first got sketched and patented was on 1947) appeared with the idea as a missile game created by Thomas Toliver Goldsmith Jr. a physicist professor of Furman University; albeit the idea was never placed on a commercial environment. To think that the idea has been for more that half of a century is quite remarkable; but in terms of contemporary history, the first modern game came in the hands of Bill Pitts and Hugh Tucks who developed the first coin operated game at the Stanford University laboratories in 1971, the game was known as Galaxy Game and that is how the revolution of the Arcade came into the market. Pong, became eventually the catalyst that placed the first generation of home consoles into the popular mainstream, and the list eventually grew placing other titles such as Pac-Man, Missile Command, Galaxian, Frogger among others. As years passed, then it came to the point of finding validation, but why to seek approval from a higher source of information,? specially from a community that had created their own niches over the decades of production. The answer could be in a bittersweet position, due political and social issues. As many forms of art, it does require the approval of communities to gain some validity; it is shallow to express it but it is one truth, as to gain consensus, the work needs the opinion of the masses. The problem relies as any form of art, between vulgarity and what art could be itself. There is a debacle of video games, indeed as a form of art, because the problematics goes on a social scale as well towards medical issues. It can be a long debate itself, but appreciating the beauty of some games such as Braid and FEZ as other indie games, gives a different perspective to the players as well general consumers; that games can show beauty on a aesthetic level, and even keep entertain without resourcing to extreme violence or just plain commercialism. Braid is one good example on how the impressionism works perfectly in the environment, it gives to the game itself a colorful palette that is almost distinctiveness to the game. But, the beauty, the art of the game itself, is not necessarily applied to the graphics as so is with Braid or any other game. The art lays on the storytelling, much as it was a movie, and as the seventh art, games do deserve a level of recognition for the compelling story telling, as well they show the form of expression of the developers. Yet, the community seems to try to find a central mainstream figure in order to get approval; there is really no need to find approval from anyone that doesn't come from the community itself, but yet it's relevant to try to find support from the mainstream in order to get the approval from the masses to find that form of artistic expression that at the end is just an affirmation. 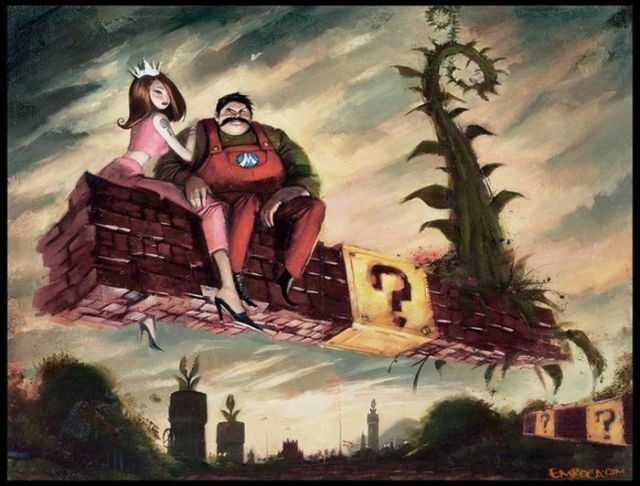 Then we have another perspective, and goes from the fandom of the video games, where in an artistic perspective they took also video games into a new level, as it never done before, towards the use of pop culture. It is silly to think, how can pop culture with an emphasis on video games can be turned into something beautiful as well beyond the mundane. Reaffirming that video games are art. The answer is indeed simple, is just a simple form of expression where the fans express what they enjoy the most as well giving a different perspective to the products of the video games.